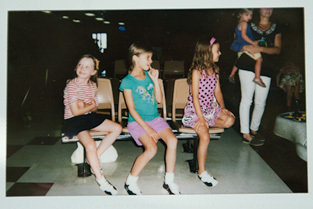 These are some polaroids that Brian took at Kate's 7th birthday party. We thought it would be fun to take everyone bowling and it ended up being such a big hit. The kids had SO much fun. We bowled, ate pizza and cake, and then opened presents. Kate has such a fun group of friends and this birthday party was definitely one to remember. Kate is so excited to start 2nd grade in the fall. She mostly loves to read, watch movies, play soccer and piano, swim, play with friends, and color. We love our sweet, hardworking, thoughtful Kate.